CodedColor PhotoStudio by 1STEIN is a powerful and versatile photo organizer and image editing software for digital camera users. 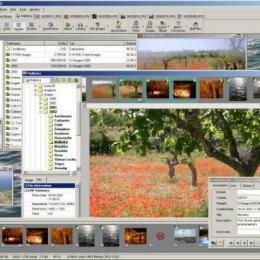 Features include photo editing & printing, web album galleries, slide shows, photo management & cataloging, custom sorting, IPTC & EXIF editor, thumbnail generation, resize & resample images, jp2000, batch conversion, database keyword searching, red eye removal, color / sharpness / brightness & contrast correction, artefacts removal, clone brush, scanner & TWAIN import, screen capture, lossless JPEG rotation, gamma correction and screenshows with many transition effects, watermark text, image annotations, panorama stitch & animation, video capture, PDF album export, photo layouts, collages, frames, shadows, automatic white balance, skype photo sharing, CD/DVD burning, flash album export, new RAW formats, GPS tagging, 50 effects, clipart gallery, transparency & alpha channel, perspektive correction, search & compare similar images, color replacement brush, wizard & tutorials, etc. Opens and converts all common image formats: BMP, WMF, GIF, JPEG, JPEG2000, TIFF, PCX, PNG, PSP, PSD, PCD, RAW, etc. Visit CodedColor.com to learn more and download a free copy! Includes BYNGO MMS messenger and Pixpedia Publisher, a versatile photo layout and DTP tool.